On the road again, this time deep south (well Carlingford at least), several North Belfast Harriers travelled to this popular seaside village for the Carlingford 5km Road Race. 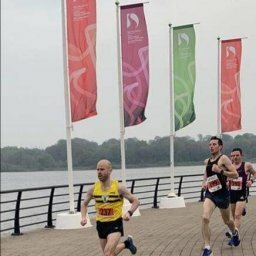 The race was won by Shane Kerr from Armagh AC in 15.24. 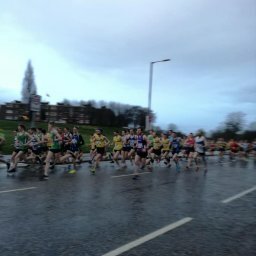 From North Belfast Harriers we had running Paul Blaney 14th/16.23,Steven Reenan 16.59 (maybe a mis print on the results)Matt Shields 17.59/36th and first over 50 (we put the prize money to good use in the bar later!!!) 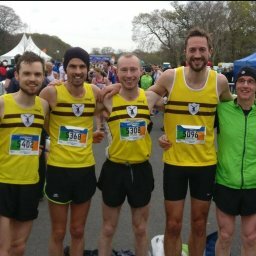 Paul Jenkins 38th/18.21,Jim Newberry 39th/18.24,Damien Gill 51/19.08 (great to see Damien racing again!!!) and Pauline (I missed a lap ) Jenkins 97th/23.08, yes she did miss a lap, but still ran really well. Also out for Dromore AC was Annette Blaney in 103/25.24.There were a total of 115 runners, and the sandwich’s etc afterwards in the hall were great, but the results afterwards were a disaster!!! The course was out and back then 3 (yes Pauline 3 laps) of the town, which was very narrow and twisting. Several of the more serious athletes stayed overnight and sampled the Carlingford nightlife until the early hours, great night, all thanks to Paul&Annette Blaney and thanks to Ruth&Matt for a great breakfast.